Budget Details Slow To Emerge, Even To Congress Lawmakers reached a budget agreement late Friday night to avert a partial government shutdown, but the details of what exactly they agreed to are a little murky. Lawmakers are realizing they've got a deal in hand, but not much else. 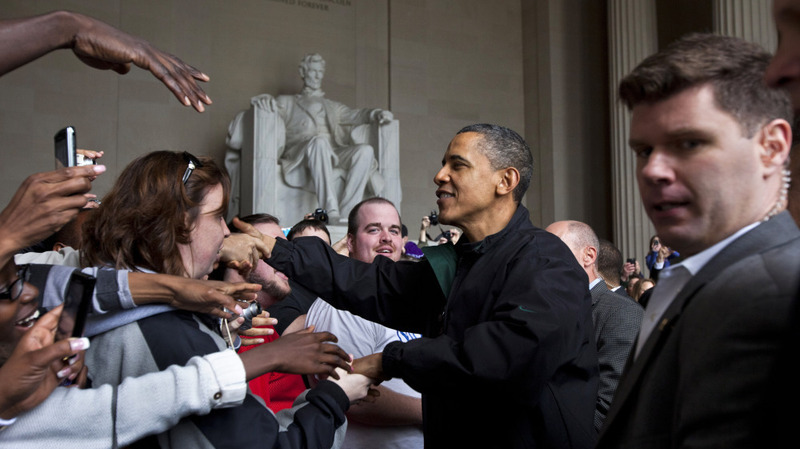 Barack Obama shakes hands with tourists visiting the Lincoln Memorial in Washington, D.C., Saturday during a surprise visit a day after budget negotiations with Congress prevented a government shutdown. For the moment, the budget debate is all over but the shouting. After lawmakers reached an eleventh-hour deal Friday night, President Barack Obama signed a temporary spending bill into place Saturday to keep the lights on at government agencies while Congress prepares the final budget for a vote this week. Meanwhile, spending committee czars and their staffs are still laying out the specifics on the spending agreement, which will cut $38 billion over the next six months. The details are just starting to emerge, and lawmakers are realizing they've got a deal in hand, but not much else. "It's a not a very pleasant experience to be forced to vote for something before you know the contents of it," says Rep. George Miller, a Democrat from California. But Republicans didn't have much more to go on, according to Allen West, a GOP freshman from Florida. "We did our votes in the wee morning hours, and that was really it," he says. "We have not had any other contact with leadership, with any other members of the conference, other than seeing people here at the Reagan airport." Miller is a veteran liberal lawmaker. West a freshman Republican, popular with Tea Party activists. NPR caught up with them on their way home to their districts. Their reactions tell the story of how tough this process of compromise has been. Neither was especially pleased with the deal. "I am not celebrating, I'm not dancing in the end zone," West says. "I think there's even more work that we have to do." For Republicans like West, the issue was the dollar value of spending cuts. Republicans have gone from seeking $100 billion in cuts during election time, to $61 billion at the start of the year, to the final figure of $38 billion. "Everybody's talking about how historic that is — the largest-ever spending cut — but you know, we're also facing the largest-ever debt and deficit we've ever had," he says. "When you put it in that context, it really is not historic." GOP wins include assurances that there will be a stand-alone vote over barring Planned Parenthood access to government money and on defunding the new health care law. House Speaker John Boehner revived the school voucher program in the District of Columbia and a ban on the District using its own local tax money for family planning or abortion services. And there will be a ban on money for transferring prisoners from Guantanamo Bay to the States. Congress had already banned such transfers last year. But the GOP did not manage to bag the bigger game it was hunting in the forest of social policy. The ban on the EPA spending money to regulate greenhouse gas emissions was dropped. The defunding of NPR was dropped. The defunding of the federal family planning program – also dropped. But liberals like Miller weren't dancing in the end zone either. "I don't consider this to be a great performance," he says. To get the trade-off on the policy riders, Democrats had to give on spending — to the tune of the largest budget cuts ever. There's a $1.1-billion cut across the board for discretionary spending and dozens of nips and tucks all over government, from Justice Department programs to subsidies for co-ops in the new health care law to the Pell Grant program for low-income college students. Democrats could only take solace in reworking the mix of cuts so that the Defense Department, certain transportation projects and other GOP favorites were hit, too. But Miller says the brinkmanship of this debate is only a prelude to the debate on next year's budget and the vote on raising the nation's debt limit – expected to come later this spring. "The stakes are going to get higher and those policy riders I do not believe will go away. I think they will be back and it's going to be very very tough negotiating," he says. The final formal budget bill, with all the details, will be revealed in the next few days so that lawmakers in both chambers can vote on it. The deal could still come apart, but judging by last week's showdown, most lawmakers are ready to move on – to the next one. Paul Ryan's 2012 Budget: Good, Bad AND Ugly?